Nowadays it is easy to consider Pac-Man a hero to children and adults alike, but his original genesis was far darker. Pac-Man is in fact a powerful anti-drug message designed to clearly display to children the dangers of drug abuse. Pac-Man represents the classic drug user. His shape is that of a pill, and he has been reduced to a simple mouth, unable to do any more than consume. Consume drugs, that is. His entire life revolves around eating pills and attempting to get fruit in order to 'score'. As the horrified game player can see, eating the pills gains him only temporary happiness, for his nightmare happens over and over again with no escape, simply the eating of more and more drugs. He is trapped forever in a maze, a maze of his own creation, trapped in a world of abuse. 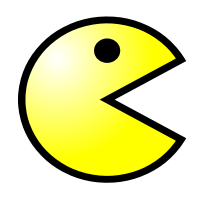 The ghosts that chase him are clearly ghosts of Pac-Men, his friends who died from overdoses, their memories haunting him to this day. When Pac-Man eats the big pills he is able to get so high that he can temporarily banish these memories, but they soon resurface to chase him again. Round and round Pac-Man goes, chased by his haunting memories and unable to get free. The only escape that awaits him is the sweet release of death. The final level of the game is the 'kill screen', where the map overloads into a drug-hazed mess of symbols and lines, showing the final overdose. No wonder children of the time were terrified by the effect drugs could have on them. Pac-Man was a key weapon in the battle against drugs, and surely saved many lives.